I’ve recently heard about a new genre of “apps” that are being developed to provide “digital therapy,” or relief from all the stress and distraction caused by… all those other apps. Yeah, it doesn’t make a lot of sense. I’ve found the best therapy for my overworked, distracted, and oftentimes anxious mind, is to get away from anything with a glowing screen. But recently, (on an eight hour drive to Northern Michigan with my family) I had the luxury of reading a whole article in the New Yorker on mindfulness meditation, and on one meditation guru in particular, Andy Puddicombe. The article bills Puddicombe, as a “mindfulness guru for the tech set.” Based in Venice Beach, California (around the corner from Google) Puddicombe is the developer of Headspace, an iPhone app that teaches meditation and mindfulness techniques. Since I have been studying and practicing mindfulness meditation for a few years now, I initially eyed this “techie” version with suspicion. Is this the real thing, I thought to myself? Or some watered down version, for Google executives and Silicon Valley types. As I read, though, I was pleasantly surprised. It turns out Andy Puddicombe, a forty-two-year old from London, was trained as a Tibetan Buddhist monk. After a series of life traumas in his young adult years, Puddicombe left college and lived for ten years in Buddhist monasteries in Nepal, India, and Burma, where he became a monk in the Theravadan tradition. He translated Sanskrit and Tibetan terms into English, and eliminated some of the trippier exercises, like ‘visualizing bright white lights.’ In the monastery, an hour of meditation was considered a brief session, but that didn’t fly with Puddicombe’s clients. ‘I realized early on that it had to feel manageable,’ he said. He set about condensing the exercises into short chunks: twenty or even ten minutes. Overall, the article was excellent. It not only described the growing mindfulness movement and the way scientists are tracking the positive effects of meditation, but it even summarized Buddhism and the history of meditation in India, dating back to before the Buddha was born in 480 B.C. So I decided to check Headspace out for myself. I downloaded the app and have been working through a free ten day trial of guided meditations. 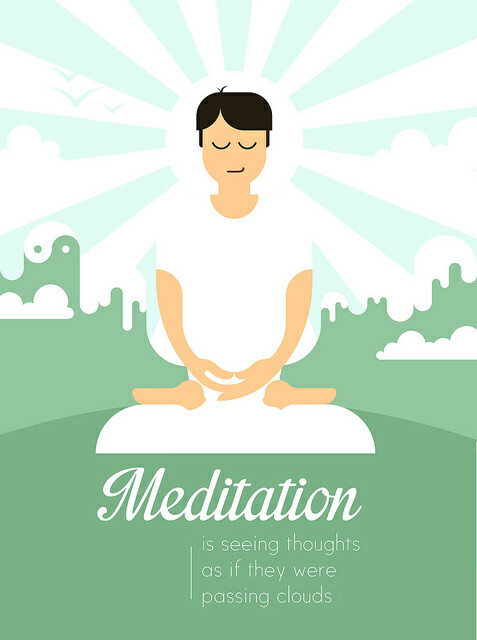 My overall impression is that this is a good resource for those new to meditation. Puddicombe is a great guide and teacher, his voice (with its endearing British accent) is gentle, positive and easy to listen to. There are some cute animations that really help you understand the meditation techniques in contemporary terms. And although, Puddicombe never uses Sanskrit, Tibetan, or Buddhist language, he obviously understands the tradition and I appreciate how he has translated it for us modern day folks. My only small critique would be that the ten minute sessions Puddicombe uses are too short to really feel the benefits of meditation. Most practitioners insist on at least 20 minutes. But again, it’s a good start. And I think it would be hard to convince the Google executive to take more than ten minutes to try this contemplative practice. Also, while listening to Puddicombe’s voice guiding me through the session, I oftentimes wanted more silence. I’ve enjoyed my sitting practice of meditating in silence, moving through my prayer beads, for twenty minutes. I feel like I get to know my own mind better this way. But again, Puddicombe’s guided version is definitely worth it. I’ve appreciated the variety it has added to my practice and I will probably even subscribe to Headspace (it’s $13.00 a month) to see what else he offers. I heard this radio story, too, and was intrigued. Thanks for sharing your experience! I may just check it out. Oh that just sounds like fun. I’m going to have to give it a whirl. Thanks for writing about it!